A 6 years old seedling. It is quite difficult to cultivate and seems to be suited to a winter growing cycle. Origin and Habitat: Aloe haemanthifolia (syn: Kumara haemanthifolia), is endemic to the Western Cape, South Africa. Habitat and ecology: This species occurs in very wet places in damp grass and moss-covered soil on the south and south-east facing Table Mountain sandstone cliffs in the Cape folded mountains. The winter rainfall is in the region of 1,000 mm to 2,100 mm per annum and the mountains are frequently enshrouded in heavy mist. It grows in rock crevices and on cliff ledges in acid, peaty soils. One population is in the spray of a waterfall and for at least part of the year has water running down through the clumps of rosettes. The surrounding vegetation is fynbos. In summer, temperatures are moderate to cool and plants receive water from moisture-laden south-east winds. In winter it can be very cold and the plants may sometimes be under snow. Aloe haemanthifolia is protected in the Cape Province, and is difficult to obtain as much of the seed is destroyed by baboons before it has matured and plant numbers have been greatly reduced by "collectors". Due to the limiting factors under which the species grows, plants occur only in small isolated patches and they do not flower out of their natural habitat. Flowering time September to December. 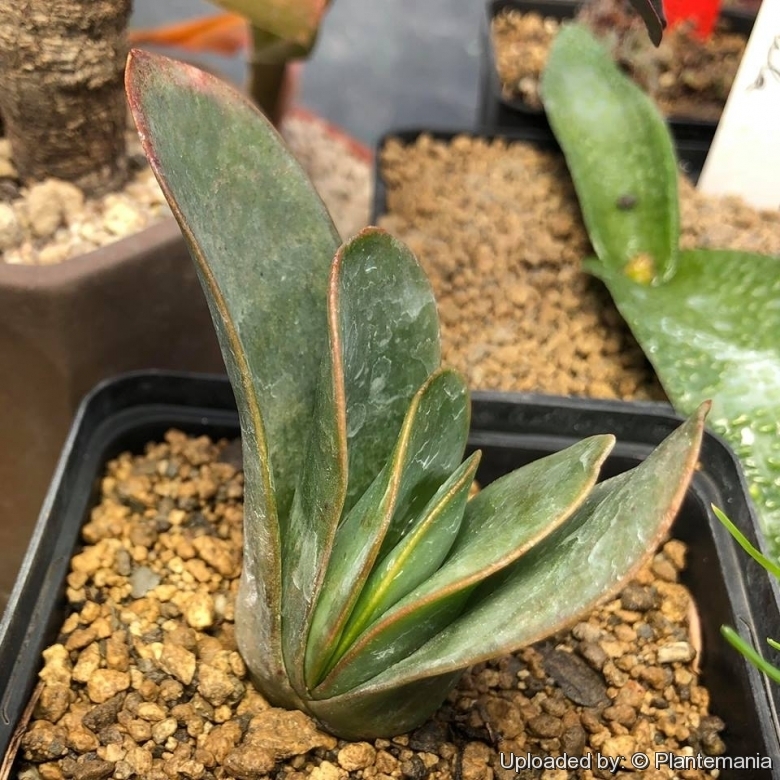 Description: Aloe haemanthifolia (syn: Kumara haemanthifolia), is a perennials succulent species about 38 cm tall, that usually suckers freely and forms dense groups of up to 20 plants, and rarely grows singly. Its large, distichous, leathery, linear, obtuse leaves, stemless habit and capitate racemes of flowers with long perianths and included anthers and styles distinguish this species from all others in the genus Aloe. Its leaves, comparatively thinner than those of other aloes, are an adaptation to the moist habitats where this species grows. Derivation of specific name. As the name implies, this very distinctive aloe has strap-shaped leaves similar to some species of Haemanthus. Leaves: 10 to 16 light to dark-green to grey-green, tinged blue with no spots, distichous arranged opposite in a 2-ranked fan), lorate (strap-shaped), leathery, fleshy, and basally sheathing, up to 18 cm long and up to 8 cm broad and they resemble, in some ways, those of the much larger plant Aloe plicata . The upper is slightly channelled. The edge is pinkish-red with no teeth. The apex is rounded but marked by characteristic notch. The leaf-sap is clear and not bitter tasting as with most aloes. Inflorescence: Simple, and up to 45 cm high in large specimens. The scarlet raceme is capitate, short, dense with acute bracts. The buds are upright, the open flowers pendulous. Flowers: 38 mm long, orange to scarlet in colour, cylindrical, and widening at the mouth. The outer segments of the perianth are free almost to the base. The perianth is somewhat clavate, that is, club-shaped. Anthers and styles are included. Notes: Both the tree-like Aloe plicatilis and the low-growing Aloe haemanthifolia, rather uncommonly for species of Aloe, have tongue- or strap-shaped leaves arranged in a fan-like manner, but they differ considerably from one another in terms of growth form and height. A. plicatilis is a branched tree, carrying its rosettes at the tips of the branches. A. haemanthifolia, on the other hand, is a low-growing, more or less stemless herb. A. haemanthifolia is one of two species of Aloe (the other being Aloe fibrosa from Kenya) to have distinct fibres in the leaves. Cultivation and Propagation: Aloe haemanthifolia is a low-growing, more or less stemless herb that, like Aloe polyphylla, does not take kindly to cultivation, refusing to survive for very long even in Cape Town.